The CS111C.FT6003 TAG Heuer Specialists Microtimer Chronograph Men’s Watch is a sleek and sporty watch with a great modern look for today’s young professional. Developed and worn by Tiger Woods, the TAG Heuer Specialists Microtimer Chronograph is designed especially for the requirements of golf enthusiasts. Its modern ergonomic design ensures that a golfer’s swing will not be interrupted while wearing the watch. The Specialists Microtimer Chronograph boasts a remarkable 1/1000th of a second precision thanks to its Swiss electronic movement. 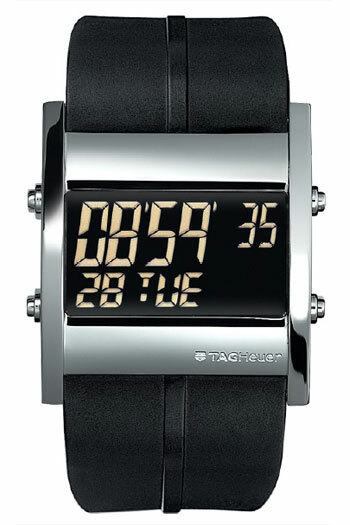 The watch features a large digital display that offers wearers a high degree of functionality. Inspired by Formula One racing, the F1 mode offers both lap time memory and best lap calculation. A dual time-zone display feature is suited for travelers and businessmen. Those who seek a traditional chronograph can utilize the additional and split time modes. The watch can also feature the current date, or can be put in stand by mode, which features only the current time. The case and bezel material used on the Specialists Microtimer Chronograph is stainless steel, and the crystal is scratch resistant sapphire. It has an 8 inch (20.3 cm) sizeable black rubber strap and is water resistant to 30 meters (99 feet).